The Mac offers several ways to switch between accounts. The most straightforward way is to log out of one account and then log in to a different account. A faster and more convenient way is to use Fast User Switching, which essentially lets you switch accounts without having to log out of one account first. To log out of an account, simply choose Command→Log Out. After you log out, the login window appears, listing the names and user icons of all accounts. At this time, you can click a different account name to log in to that account. Before you can log out, a confirmation dialog appears, as shown in this figure. Your open files and apps will be closed before logging out. Select the Reopen Windows When Logging Back In check box so when you log in, your Mac looks just like how you left it when you logged out. Hold the Option key while logging out to avoid the confirmation dialog. If you use Fast User Switching, you won’t have to bother with any of that because Fast User Switching gives the illusion of putting the currently active account in “suspended animation” mode while your Mac opens another account. 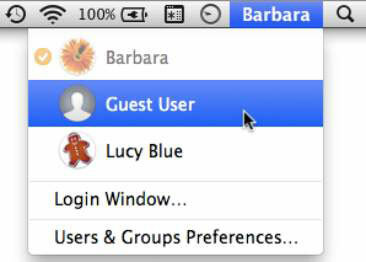 Choose Command→System Preferences, and then click the Users & Groups icon. If the lock icon in the lower-left corner of the preferences window is locked, click to unlock it and then type your password in the dialog that appears. Press Return to unlock your Mac’s user account details. Click the Login Options icon at the bottom of the list of users on the left side of the pane to display the Login Options pane, as shown in this figure. Select the Show Fast User Switching Menu As check box, open the pop-up menu, and choose how you want to display the Fast User Switching Menu: Full Name, Short Name, or Icon. These options display what appears on the menulet. Full Name displays full account names, Short Name displays abbreviated account names, and Icon displays a generic icon that takes up the least amount of space in the menu bar. 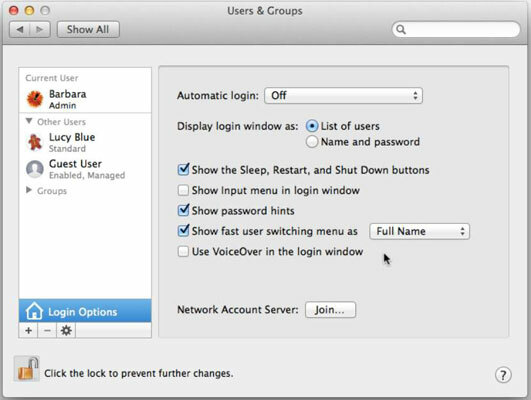 Automatic Login: Leave this option Off or choose one user who will be automatically logged in when you restart your Mac, which is handy if you’re the only user and your Mac is always in a safe place. Display Login Window As: Choose List of Users (from which you click a user and then type in the password) or Name and Password (which requires you to enter both your user name and password). Show the Sleep, Restart, and Shut Down Buttons: Select this if you want to see these buttons on the login screen. Show Input Menu in Login Window: Allows users to choose the language they want to use when logging in. Show Password Hints: Users can click the question mark on the login screen to see a password hint, which you set up when you created the user account name and password. Use VoiceOver in the Login Window: Select this if you want VoiceOver to work during login. Click the Close button to close the Users & Groups preferences pane. When you enable Fast User Switching, the Fast User Switching menulet appears in the right side of the menu bar, as shown in this figure. The menulet displays the names of accounts you can choose. Click the Fast User Switching menulet on the right side of the menu bar and then click the account name you want to use. Type the account password in the dialog that appears and press Return. Your Mac switches you to your chosen account.